The sun haven’t came out yet when I woke up. It’s always like this these few days, always woke up even before the alarm is ringing. Looks like shiver is a better alarm for waking up early. Why was it so cold anyway? It’s -16 degree Celsius outside and I’m still at Dingboche, Nepal, on my way to Everest Base Camp. The altitude was only 4530 m but it’s already snowing. As a guy from South East Asia, that was the first time I ever experience snow. It was beautiful but deadly cold, especially when there’s only wooden boards as wall and a sleeping bag to protect you from the weather. Contemplating about the cold and reason why I here was my routine every morning on my bed, before dragging myself up to wash my face and brush my teeth. When I enter the dining room, Pasang, my guide and also my friend, usually offer me something hot to drink. A cup of hot lemon and quick breakfast, then I was ready to start the trek again. Being on the trek, keep walking and climbing was actually my favorite part. It was exhausting but there’s always something that push me, keep me going. One time it was a sudden realization that I was finally in Nepal, doing the trek that I always dreaming since two years ago. 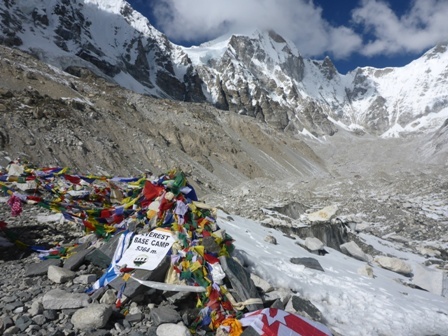 Another time it was an overwhelming curiosity, to know what it’s like on the Everest Base Camp, the shoulder of the highest mountain on earth, to know the feeling and to know the path leading there. Another time it was simply seeing yaks and the panorama and the sound, the sound of river stream far below and the sound of wind blowing. Once when resting, I simply lay down on the snow, kept my head up and I saw the sky, a sky so blue that makes me wonder if it’s always this blue in the sky back at home? I promised myself to look at the sky more often when I come back, and hope the concrete buildings won’t block my view. It was a battle of willpower once again, and this time it’s a marathon.. The mountain gave a formidable fight. I was not the same when I was climbing Mt Gede a year ago, but still need to count on willpower and pride to keep moving my leg forward one at a time. And for all the time to think, to let my mind drift away when walking an easy part of the trek, how nice was that! Pasang was not much of a talker on the trek and we were getting along well that way by being quiet. It was a mixed feelings of joy and fatigue, of sorrow and strange desire. Being on the mountain this long, I started to think at some point it is similar to participating a triathlon. You train your body months before, preparing your gears to be finally out there feeling exhausted but you’re happy when you’re out there, and the feeling of reaching the finish line, that glorious feeling! It was on the 8th day that I finally reached the base camp. While on the trek I keep wondering what would I feel when I finally reach it, would I be energetically happy or would I cry with joy? But none of that… I just know that what I felt was a great feeling, like you aim to do something and you know you try really hard, and you finally succeed. It was kinda sad too, because it’s over but at the same time felt really glad for the same reason. I thanked Pasang for helping me achieve my dream, then I spent a few minutes alone, listening to the sound of wind and felt the coldness in my face. Trying to absorb it all, all the efforts needed, all the things that was prepared, all the experiences here. For all the time spent preparing myself, motivate myself on trek to keep going. About how silly my dream was and how I managed to grabbed it. 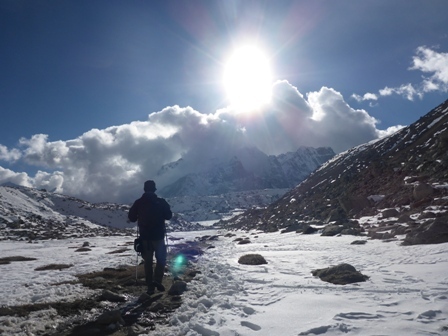 I thought about the exhaustion, the freezing wind, the life on trek, the people, everything. I have proved myself that I can reach it, mission accomplished.